Registration includes snacks, beverages & lunch. 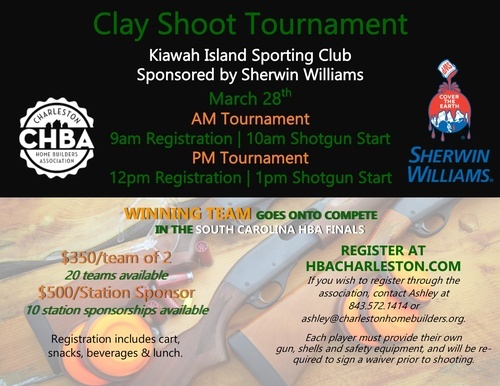 Each player must provide their own gun, shells and safety equipment, and will be required to sign a waiver prior to shooting. From Highway 17 turn on to Main Rd. proceed past Maybank Highway which will then turn into Bohicket Road. When you pass the Presbyterian church on the left we will be the first mailbox on the left, about a mile down the road. Directions from Kiawah Island, Take Betsy Kerrison towards Hwy 17. At the stoplight at the intersection of Bohicket and River Road proceed straight on Bohicket Rd. for exactly 1.1 miles. A galvanized metal gate will be on the right, just 200 yards past the John's Island Day Spring.